More than a dozen people took part in bald eagle observation training on Saturday at the new environmental learning center. On Saturday afternoon, more than a dozen interested persons filed into the new environmental learning center at Caldwell Park to become trained to help the Iowa DNR monitor the bald eagle’s nest. 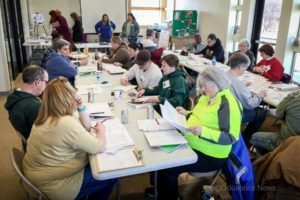 Every March, Shepherd travels around the state to lead training workshops that prepare folks to collect data on some of Iowa’s critical wildlife. Last year, Volunteer Wildlife Monitors collected data on over 150 Bald Eagle nests statewide. The training workshop on March 16th will prepare folks to safely observe and record data on a nearby Bald Eagle nest and then submit that data to the DNR. Monitors make at least three visits to the nest site between March and June and record the success or failure of the Bald Eagle pair to raise young. “This data collection requires lots of patience and some good binoculars or a spotting scope in order to watch the nest from a distance and not disturb the birds,” Shepherd indicates. Mahaska County Naturalist Laura DeCook explained that Mahaska County Conservation was happy to host the training seminar in their new location east of Oskaloosa. Eagles and eagle watching are a favorite past time of many Mahaska County residents, and the training gives one more tool that those interested in the birds can use while helping document how the birds are now thriving in Iowa. “Local people know where the nests are. If they are interested in bald eagles, they’ll find the nests, they’ll watch them, take photographs,” said DeCook. The American Bald Eagle was once a very rare sight in Iowa, but their populations have grown through environmental initiatives to the point where eagles are now a fairly common sight across Iowa. The class helps those observers understand all the steps needed to observe, without disturbing the nest or the eagles in it, and what to look for. As the eagles lay their eggs, the observers get to watch the whole process from early on, to the young eagles taking flight. DeCook was also excited to host yet another event in the new environmental learning center.